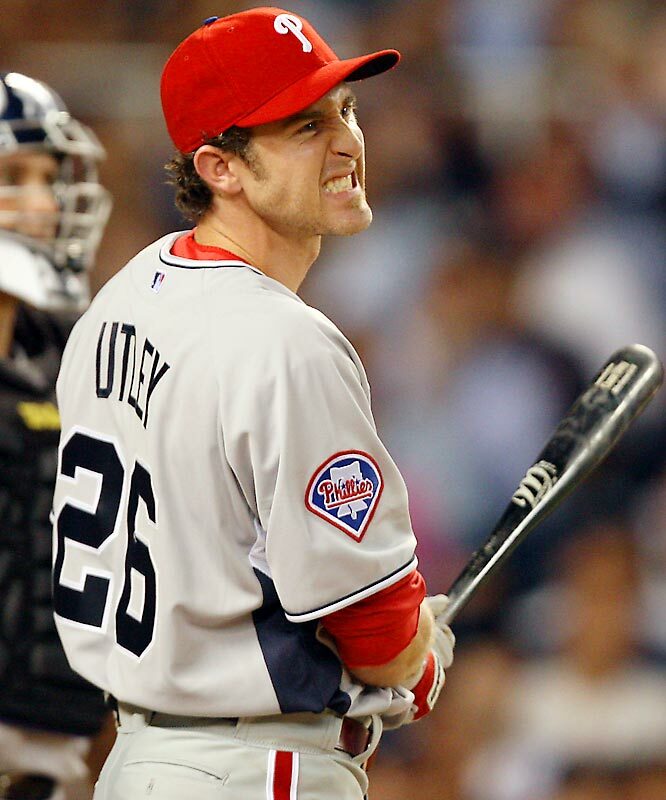 Advanced Fantasy Baseball: Is Chase Utley a Safe 2013 Fantasy Baseball Pick? That an aging and increasingly brittle second baseman such as Chase Utley must still be considered one of the best available at the position is both an acknowledgement of his talent and of the lack of offensive ability at the middle infield positions. Once past the third tier (all of my second base tiers are listed below) the talent drops off into the undesirable range very quickly. There is some promising talent on the way but until it becomes proven they won't be of much use in shallower mixed leagues. Jedd Gyorko of the Padres, Kolten Wong of the Cardinals, Delino Deshields of the Astros, Jonathan Schoop of the Orioles and Brock Holt of the Red Sox are some of the talents closet to contributing to fantasy teams. Gyorko and Wong could start the season in the major leagues. I think Gyorko could be a major rookie of the year candidate and he is one of my favorite deep NL-only picks this year. I am not as big on Wong. Wong has skills that are improving but gets a lot of value from defense and intangibles which will not be an asset to most fantasy teams. What are we looking for from our second basemen? It used to be that if he hit for a decent average and stole a few bases fantasy owners would be happy. But times changed and power became a more frequent requirement from the position. Stolen bases are almost a given these days but the power we enjoyed last decade is fading fast. These days we'll take batting average, decent power and a smattering of stolen bases and not complain too much. Utley of course was once a lock to be one of the top two or three at the position. He hit for average, got on base, hit for power, stole bases and played excellent defense. He still does all of those things but has become very injury prone - mostly his bad knees. He has changed his workout routines in an effort to be better prepared for the season but I would hesitate to count on him for more than 400 at-bats and it could be less than that. Last season in 301 at-bats (362 plate appearances) Utley delivered a .256/.365/429 batting line with 48 runs, 45 RBI, 11 homeruns and 11 stolen bases. That is not so terrible when batting average has become less of a priority to major league hitters but it is far from what Utley could once provide. What those numbers tell us is that Utley can indeed be productive for as long as he is on the field. Certainly on an at-bat to at-bat basis Utley is better than most at the position. Fantasy Owners can feel secure selecting Utley as long as they do not pay for more than 400 at-bats and have a plan to cover his almost inevitable time on the disabled list. Robinson Cano, New York Yankees - Cano is the best bat at the position by far. He hits like a potential batting champ and is a near lock to provide around 30 homeruns. Typically his Yankees lineups are so good that 100 runs and 100 RBI are always in range. With the deluge of injuries and the lack of established replacements the run and RBI totals are not as certain. Dustin Pedroia, Boston Red Sox - Only the occasional injury and last year's slump keep him from joining Cano in the first tier of the position. He provides average, some power and stolen bases and bats near the top of an excellent lineup. Ian Kinsler, Texas Rangers - He has been a bit inconsistent but Kinsler can do it all. He is a solid bet for an annual 20/20 season and 30-plus homers are very possible. Jason Kipnis, Cleveland Indians - Kipnis ran into some growing pains in the second half of the 2012 season but still put up great overall numbers. He has 30 homer potential and should steal at least 20 bases if not the 31 he totaled in 2012. Aaron Hill, Arizona Diamondbacks - Consistency is not his bag but he is usually good for 20-plus homers and a double-digit smattering of stolen bases. The Diamondbacks love to run so he could steal 20-plus bases again. Jose Altuve, Houston Astros - A lack of power and a lousy lineup are keeping him from ranking better. But we will take the 30-plus stolen bases all day. He actually does have a little pop for a little guy but that is not his game and expecting more than a few homers would be to court disappointment. Rickie Weeks, Milwaukee Brewers - A massive slump through the first half the 2012 season has eroded his fantasy value a bit. He was pretty much his old self in the second half. There were actually signs of him becoming a better, more patient hitter. Brandon Phillips, Cincinnati Reds - Is Phillips the coolest guy in the game? He's good for close to 20/20 every season and should have a big year in the souped up Reds lineup. Chase Utley, Philadelphia Phillies - Talented but injury prone. Dan Uggla, Atlanta Braves - Usually one of the positions's better power options, he slumped badly in 2012. He seemed to start pressing to break the slump which only made it worse. He is the type of player that can fade quickly so be cautious selecting him. Howie Kendrick, Los Angeles Angels - He has never seemed to reach his full potential as a possible batting average star with some power and speed. But he is an excellent pick this season if for nothing but his place in the middle of the Angels lineup. Neil Walker, Pittsburgh Pirates - He should hit for a decent batting average with a dozen or so homers and a few stolen bases. He no longer has the talented Brock Holt keeping an eye on his job. Kelly Johnson, Tampa Bay Rays - His batting average will be lousy but he has 20/20 potential. It appears the Rays will start him at second base but back him up well. Danny Espinosa, Washington Nationals - A shoulder injury that he chose to rehab without surgery has some analysts worried. It has the potential to impact his power numbers. Steve Lombardozzi is ready to pounce on his job. Jeff Keppinger, Chicago White Sox - He hits for average with a few homers and steals. He qualifies all over the infield and could change positions depending on the production of players like Brent Morel and Gordon Beckham. Carlos Sanchez is almost ready for a shot at the majors and he has big stolen base potential. Dustin Ackley, Seattle Mariners - He was a big disappointment in 2012. He is expected to hit for average with some power and some stolen bases. Some people expect that anyway. Brian Roberts, Baltimore Orioles - He looks healthy this spring but we've seen this before. I would not count on him to play the entire season. If healthy he should steal some bases assuming his legs are still good. Eric Young Jr., Colorado Rockies - New Rockies manager Walt Weiss seems determined to create more of a role for the talented and versatile Young. If he gets at-bats he should steal a ton of bases. It would not take too much imagination to see him starting at second base or in the outfield at some point this season. Omar Infante, Detroit Tigers - This is probably the last player on the list that I would want to draft. Everyone below this would make me just a little sick. He has some power and will steal some bases. He could have a really good season in Detroit. Gordon Beckham, Chicago White Sox - After a fast start to his career Beckham has done nothing but disappoint. He has some power and can steal bases but he is not a disciplined enough hitter to deliver for fantasy owners. Daniel Murphy, New York Mets - He does not hit for much power or steal many bases but he does hit for a decent batting average. He is probably a bit underrated due to the Mets lousy lineup. Marco Scutaro, San Francisco Giants - An excellent contact hitter with some on-base skill. He hits a few homers and steals a few bases. His teams always seem to be searching for his replacement. Your fantasy team will not be any different. Maicer Izturis, Toronto Blue Jays - Battling Emilio Bonafacio for the role of starting second baseman. He is better suited a bench role and that is likely his destiny. Tyler Greene, Houston Astros - He is only a decent hitter but he has the power and speed to provide fantasy owners with double digit homers and steals. He is projected as the starting shortstop for the Astros. Logan Forsythe, San Diego Padres - He had better hope that Jedd Gyorko struggles defensively this spring. Gyorko can hit circles around Forsythe. Forsythe has a tiny bit of power and some stolen base ability but is not much of a contributor to a fantasy team. Darwin Barney, Chicago Cubs - A defensive whiz who has managed decent batting averages and some stolen bases. He is not worthless but his value is only the result of the starting role he has no real skills that a fantasy owner would covet. Donovan Solano, Miami Marlins - He could be the starter for the Marlins now that the team has been decimated. If he is better than average at the position it would be a great season for Solano and still without much fantasy value. Jamey Carroll, Minnesota Twins - He can hit for average but he may be coming off the ben ch this season as the young Brian Dozier is likely to win the starting shortstop job. Mark Ellis, Los Angeles Dodgers - He gets on base but that is about it for fantasy owners. I fully expect Dee Gordon to take over at second base at some point this season. The sooner the better. Alexi Casilla, Baltimore Orioles - The most likely candidate to replace an injured Brian Roberts. He can steal bases and some unrealized power potential. Jemile Weeks, Oakland Athletics - Battling Scott Sizemore for the second base job after a disappointing season. But based on potential alone he should win the job. Steve Lombardozzi, Washington Nationals - Danny Espinosa's potential replacement. He's a gritty gamer type that the Diamondbacks would love. Chris Getz, Kansas City Royals - He should be sitting on the Royals bench but because manager Ned Yost is in love with him he will continue to battle Giavotella for the starting second baseman job. Johnny Giavotella, Kansas City Royals - He has the bat to move way up this list. He should hit for an excellent batting average with some power and stolen bases. DJ LeMahieu, Colorado Rockies - He can hit. He has no power. He has some speed but nothing exciting. But he can hit. Ryan Roberts, Tampa Bay Rays- He has some power and might be productive if the Rays give him a chance to play. Ryan Raburn, Detroit Tigers - He looks like a bench player this season. That is probably for the best. Freddy Sanchez, San Francisco Giants - To rank higher he would have to stay healthy for a few dozen at-bats per season. Scott Sizemore, Oakland Athletics - Battling for the A's second base job. He has a little power and a some stolen base skills but nothing to get excited about.